It makes composition so much less lonely. Yes, I’m still sitting alone in my house making things up, but other people can chime in and help me think through neat dramatic issues or musical ideas if they want to. And the best part is that they can participate while I’m still technically alone, which means I can focus on work instead of on making sure that their glasses are filled up and that they’re suitably entertained while they’re in my house. It’s awesome. Greg Jukes is playing the piece I wrote for him, Crystal Tresses in the Sky, on July 27, 2012 at the Exapno New Music Community Center in Brooklyn Heights. He and I fixed it a little on Twitter one night to help get ready. That is a video that Greg made in two seconds of him trying out basically what I described two tweets ago. I can’t figure out how to get that video to just embed in storify, but you should be able to click through. I don’t know why Greg is upside down in this video and I don’t care. Maybe there was scotch involved. It seems like I only use storify to write about online creative processes, since the only other time I’ve done it was to write about Amanda Palmer webcasting a practice session, which was awesome. Art used to be a private thing because it had to be. Now we get to be as private or as public as we actually want to be. Cool. A lot of the time I’m spending writing Summer’s Twilight is spent framing questions about drama and thinking about the answers, then writing the music that reflects the way the drama should be. And I love online collaboration. So I just started writing up the questions I’m asking myself on Tumblr instead of in a notebook. Then, while I work on the answer, I also have input from the wider intertubes, that is seriously helpful. By the way, thank you Paul Mathews, thank you Janet Brusselbach, and thank you Caitlin Rowley for you help. Apart from helping to answer my dramatic questions, it also means my work isn’t so solitary. Sometimes I like to be that lonely, but not that much. Ask any composer, being less alone is huge. If you want to see what I’m talking about, check out five posts from my tumblr last Saturday starting with this one. 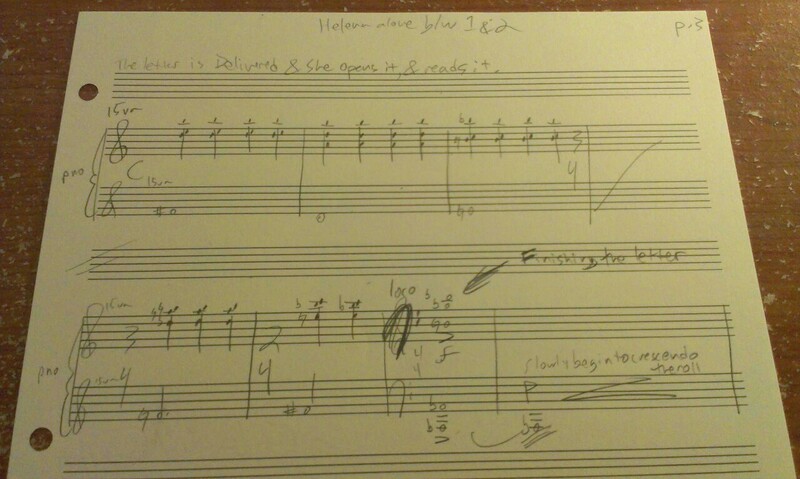 I started by talking about a moment that was giving me trouble, and ended with this series of chords. Caitlin Rowley has been doing it (and I’ve still never met her, but we’re basically internet friends at this point). Qkazoo has been doing it on Tumblr. And then Gabe Kahane posted a sketch of a string quartet. He didn’t ask for any feedback, but still there it is. I think I’ll actually be taking this weekend to write music, which is a godsend. I’m hoping to take the weekend, go to Philly, hang out with my parents a little and write a ton. So I’m probably going to be putting out a lot of these questions about how to work out a dramatic issue in my midsummer adaptation, working with what you guys say and what I think, and posting what I write once I figure out each little thing. Hopefully it’ll be fun, and hopefully I’ll see you on the 27th. Next story Arts, meet Capital. Then meet crowdfunding.